A diac is an important member of the thyristor family and is usually employed for triggering triacs. A diac is a two-electrode bidirectional avalanche diode which can be switchedÂ from off-state to the on-state for either polarity of the applied voltage. This is just like a triac without gate terminal, as shown in figure. Its equivalent circuit is a pair ofÂ inverted four layer diodes. Two schematic symbols are shown in figure. Again theÂ terminal designations are arbitrary since the diac, like triac, is also a bilateral device. TheÂ switching from off-state to on-state is achieved by simply exceeding the avalanche breakÂ down voltage in either direction. A diac is a P-N-P-N structured four-layer, two-terminal semiconÂ­ductor device, as shown in figure.A. MT2 and MTX are the two main terminals of theÂ device. There is no control terminal in this deÂ­vice. 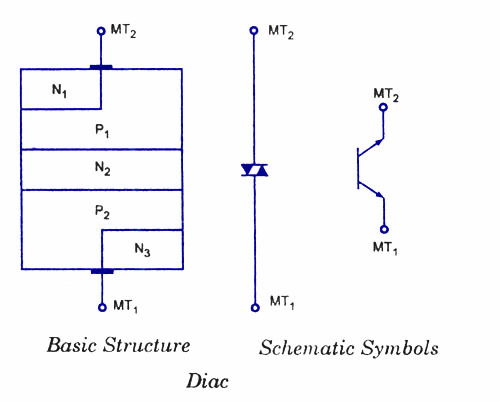 From the diagram, a diac unlike a diode, resembles a bipolar junction transistor (BJT) but with the following exceptions. the doping level at the two end P-layers is the same so that the device gives symÂ­metrical switching characteristics for eiÂ­ther polarity of the applied voltage. When the terminal MT2 is positive, the current flow path is P1-N2-P2-N3 while for positive polarity of terminal MT1 the current flow path is P2-N2-P1-N1. 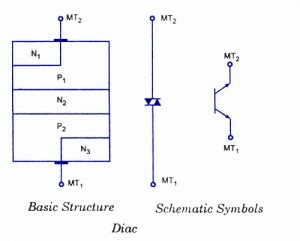 The operation of the diac can be explained by imagining it as two diodes connected in series. When applied voltage in either polarity is small (less than breakover voltage) a very small amount of current, called the leakage current, flows through the device. Leakage current caused due to the drift of electrons and holes in the depletion region, is not sufficient to cause conduction in the device. The device remains in non-conducting mode. However, when the magnitude of the applied voltage exeeds the avalanche breakdown voltage, breakdown takes place and the diac current rises sharply, as shown in the characteristics shown in figure. 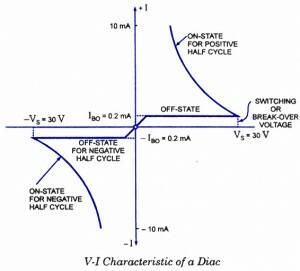 Volt-ampere characteristic of a diac is shown in figure. It resembles the English letter Z because of the symmetrical switching characteristics for either polarity of the applied voltage. The diac acts like an open-circuit until its switching or breakover voltage is exceeded. At that point the diac conducts until its current reduces toward zero (below the level of the holding current of the device). The diac, because of its peculiar construction, does not switch sharply into a low voltage condition at a low current level like the SCR or triac. 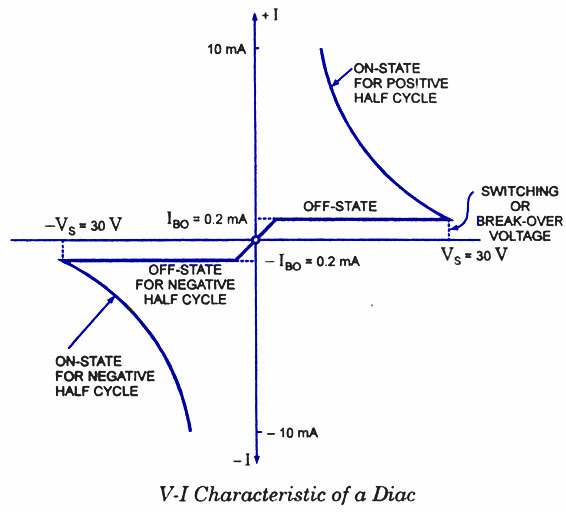 Instead, once it goes into conduction, the diac maintains an almost continuous negative resistance characteristic, that is, voltage decreases with the increase in current. This means that, unlike the SCR and the triac, the diac cannot be expected to maintain a low (on) voltage drop until its current falls below a holding current level. Hi Ayman please go through the following link.